Hollymount is a subdivision of the townland of Caherbarnagh. At the time of the building of Hollymount School, while it was part of the Clerical Parish of Rathmore, it was in the Civil Parish of Drishane. The barony is West Muskerry. Local tradition says that on an occasion, a curate from Rathmore was on a sick-call to the area, and not knowing the exact location of the house, he saw a group of children playing. He approached them and asked them for directions. Alas, they couldn’t answer him as they spoke only Irish. The curate on his return to the presbytery is said to have impressed on the then parish priest, Canon Walsh, to set up a school in the locality for the proper education of the children of the locality. The initial application for the building of a school in Hollymount was made in December 1866. The locality was then known by its Irish name, Knockacullin, and this was the name on the initial application. However, the Inspector reported that the “manager seemed to say the school-house should be called Hollymount-the English name of Knockacullin”. And so Hollymount it was called. The site was given by the local landlord, Captain William Fagan, of the Military Barracks, Cork. It is interesting to note that its situation was described as being on the ‘road joining the old and new raods from Millstreet to Killarney’. The site measured 50 x 40 yards and the expected school population was 80 males and 80 females. The application to the Commissioners was granted in the Autumn of 1867. The cost of the was to be £306 and the furnishings £60.2s.0d Grants of £204 and £40.140d respectively were allowed. The remainder of the monies had to be found locally. The buildings were completed satisfactorily and John Charles Dineen was appointed Principal of the Boys’ School with effect from 1st August 1871 and Miss Mary O’ Sullivan was appointed Principal of the Girls’ School. John Charles Dineen, now 20 years of age, had taught under the Board elsewhere for two years and had been teaching in Sunday’s Well, in Cork. He came from Milleen and settled in Hollymount. Miss Mary O’ Sullivan came from Clounts and had been teaching in Knocknagree. She later married John Cronin, from Awniskirtaun, and the settled in Shinnagh. Her son, Diarmaid Cronin, was well known in primary education in Rathmore Parish at a later stage. It is rather interesting to note that the author, a grandson of John C. Dinee, became for a time an Inspector with the Department of Education and that a grandson of Mrs. Cronin, Breandan O Croinin, is a Deputy Chief Inspector of the Department of Education. From the evidence of early records, it would appear that both principals suffered their share at the hands of a cruel system of inspection and would hardly have wished their grandchildren into such an occupation! In the Girls’ school, an assistant was appointed on 1st January 1872. She was Eliza Herlihy (better known as Bessie). She had previously been a moniteress in Rathmore. She married Moynihan. At a later stage, as she contravened a rule regarding residence in a licensed premises, payment of salary was disallowed to her and she promptly resigned. Mary Guinee was appointed to the school in 1883. In marriage, she became Mrs. Mary Hickey and continued in the school until 31st December 1896 when she left due to ill-health. Mrs. Cronin continued alone in the school until she retired on the 30th September 1903. She was succeeded by Miss Margaret Scannell, of Tieraboul- a trained teacher. Miss Scannell was a remarkable teacher and in time when official criticism of teachers and their methods was the general rule, she was highly praised. She married about 1909, Michael Burns, the then Principal of Knocknagree Boys School and lived in Rathmore. Unfortunately her life was short and after an illness of about six months she died on 8th April 1914, aged 33 years. She left two children, one of whom (Con) became an authority on primary education in Cork, and, in his later years, a lecturer in education in University College Cork. Mrs. Burns was succeeded as Principal on 13th May 1914 by Miss Kate Hickie, better known as ‘Daisy’, a name well known to the older generation of women in the parish as she taught in a few schools. On 2nd June 1914, Ellie Cronin, of Caherbarnagh, was appointed as J.A.M. and continued to teach in the school until the end of June 1927. She was succeeded by Miss Julia McCarthy, who took up teaching duties on 15th July 1927. Miss McCarthy and Miss Hickie continued together until July 1934 when a number of changes occurred within the parish. In the change about, Miss McCarthy finished in Hollymount on 28th June, 1934 and went to Knocknagree. Miss Hickie finished on 27th July 1934 and went to Knocknagree Girls’ national School as Principal and Mrs Nora Dineen, who had been Principal in Tureencahill Girls National School, came to Hollymount Girls’ School as Principal and took up duty there on 1st September 1934. Meanwhile Miss Catherine Hickey, of Hollymount, was appointed J.A.M. on 16ht July 1934, having taught previously in Shrone. There were changes also in the Boys’ School which resulted in the amalgamation of both schools into a mixed school on 1st January 1935 with Mrs, Nora Dineen as Principal. John. C. Dineen, as stated, was Principal of the Boys’ School from 1st August 1871. John Doherty was appointed assistant on 1st January 1872. He continued to the end of September when he changed to Gneeveguilla. Timothy Scannell succeeded him and continued until 30th June 1875 when, , it would seem, he changed to Rathmore. From this until 1914, John Dineen taught on his own, although in 1883 a monitor, P. Moynihan, is mentioned. In this, as in other schools, there was a problem with average attendance for the appointment of assistants. While the enrolment was high -75 to 80- the attendance tended to be seasonal, especially the winter half of the year which left the average attendance for the year at a very much lower level. It is recorded locally that pupils of and advanced age –one 29 years of age-attended merely to learn English. An interesting aside here is that a family from Caherbarnagh who attended for this purpose, later emigrated to New Zealand, where one of the descendants became a Government Minister for Labour. Miss Mary Cronin, of Caherbarnagh, (known locally as Mary the Jobber) was appointed a J.A.M. to the Boys’ School on 2nd June 1914. For some reason she left on the 31st December 1914 and was succeeded by Katie Cahill, J.A.M., who stayed until the end of March 1915 when Miss Mary Cronin was again appointed on 1st April 1915 and she continued until 31st December 1924. She married Cahill of Gneeveguilla and resigned from teaching. John C. Dineen resigned on pension on 30th June 1916 after a service of 45 years and was succeeded by his son John F. Dineen on 1st July 1916. When Miss Cronin (Mrs Cahill) resigned, her position was filled by Miss Nora Leary, J.A.M., of Hollymount of 1st January 1925 and she taught in the school until 7th September 1928 when she changed to Carrigaline. She was replaced by Mrs. Eileen Cox who took up duty on 10th September 1928. 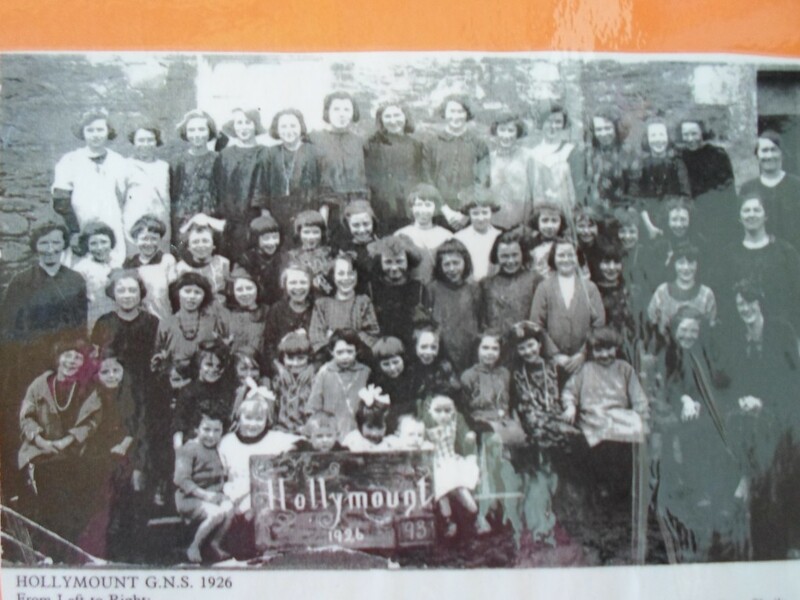 Mrs. Cox continued in Hollymount until about November 1934 when she was transferred to Carrigaline National School. This move then resulted in the amalgamation of both the Boys’ and Girls’ Schools on 1st January 1935 with a staff of Mrs. Nora Dineen, Mr. John Dineen and Miss Catherine Hickey. With declining numbers, Miss Catherine Hickey (later Mrs. Fleming) had to transfer to Tureencahill in October 1938 and Hollymount in a short few years fell from four teachers to two. The building was now old and in bad repair and plans were drawn up for a replacement school. This was built in 1942 by Mr. Dan Dennehy, a local contractor from Clounts. The old school was finally closed on 4th December 1942 and the new school was occupied after the Christmas break on 11th January 1943. It is a tribute to the work of Mr. D. Dennehy that no significant repairs had to be effected on the school until 1984. Mr. John F. Dineen retired on 30th September 1955 and was succeeded by Mrs. Theresa Sheehan. Mrs. Nora Dineen retired on 31st December 1955 and was succeeded by Mr. Diarmuid Moynihan on 1st January 1956. Mrs. Theresa Sheehan transferred to Knocknagree on 18th January 1960 and Miss Bridie Dineen, then in Knocknagree, came to Hollymount. Miss Dineed left on 30th June 1970 and was succeeded by Miss Joan Riordan (later Mrs. Rahilly), who stayed for four years until 30th June 1974. Mrs Walsh took up duty on 2nd Septemebr on 2nd September 1974. Later Mrs. Walsh became Principal of Hollymount NS. She remained in Hollymount until her retirement in 2006. Mrs. Maura Hickie became Principal of Hollymount following, until her retirement in 2012. Mrs. Hickie oversaw the extension of the school in 2006-2007 when a brand new classroom, staffroom and office were built. The building was also completely refurbished. The present Principal, Ms. Linda Dennehy, from Rathcoole, took up her role as Principal of Hollymount NS on 12th March 2012.